With Day 2 in the books and entry for day 3 underway, we’ve approached halftime. Halfway through the madness. Chicago, is your glass half empty or half full? Have you connected with the music and the people who live it? Look around, and you’ll see through the Lollapalooza lenses that we have progressed. We’ll have what they’re having. The world is turned upside down during Lollapalooza, what with doctors, lawyers, and business executives subjected to riding on trains with degenerate teens, dirty sweat-caked creative types and everyone in between. It’s madness, and you’ve gone mad. We’re all mad! Weaving through the madness, one can find solace in generations colliding through otherwise nonexistent conversation. Older heads don’t want to relinquish their youth, so they engage and initiate observations, alluding to their own recognition of today’s most sought after artists, both parties knowing darn certain it’s a stretch to imagine they’ve been up on Future Hendrix or Miike Snow or Chance the Rapper. The older you get, the further you are from being in touch. That’s ok, and in eavesdropping on diverse conversations among strangers we’re able to pick up a few, “I remember seeing the Red Hot Chili Peppers on The Tonight Show with Johnny Carson, no it was the fellow after Johnny Carson. What was his name?” Another older generational chimes in, “Jay Leno!” Eyerolls giving way to genuinely interested responses from the younger generationals when asked who else is on the bill at Lollapalooza this year is a different type of progress. Ageism giving way to mutual love of music. The youth is not quite conscious enough to appreciate what they’ve inherited, because they’re doing all the wrong drugs. Everyone’s experimenting though, and that’s another different type of progress. Only through experimentation, open mindedness and courageous creative critical thinking can we move past the so-called barriers that hold us back from actualizing our interconnectedness. Musical diversity allows longtime fans of Radiohead and Foals and Miike Snow to mingle and converse with fans of Mac Miller and A$AP Ferg. In an unprecedented turn of events, we’ve ushered trap into the mainstream, something no one could’ve ever predicted. This is another different type of progress, music paving the way for a deeper understanding that what makes us different is what’s fun about being a human. Embrace the progress. 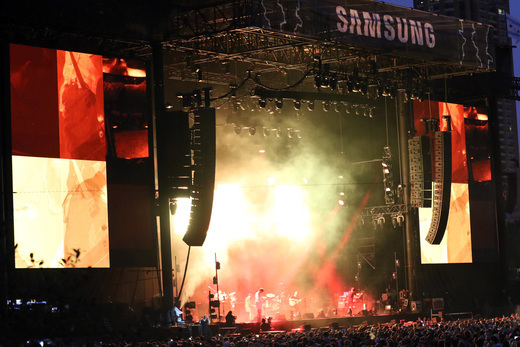 Radiohead went beyond progress by taking their set on the Samsung stage to a whole new dimension altogether. With a catalog as extensive and diverse as theirs, they were once again able to transport attendees to an alternate reality through music. Watching Thom Yorke and the gang is a transcendent experience, and they melded new and old material seamlessly. In a time where emphasis of encouragement and empowerment is given to the individual to take charge of their life and destiny, no band sums up that philosophy better than Radiohead.